A pretty classy looking Frankenpen. About a year ago, my parents’ friends in Germany gave me a pair of fountain pens that they no longer used. One was a Lamy ST, which is still in production, and the other was a Lamy 25P school pen that is no longer being made. Interestingly, both pens had suffered from a similar problem: a cracked inner cap. For the Lamy ST, this is a fatal condition, since a part of the inner cap acts as a clutch ring, whose purpose is to keep the cap on the pen. That part of the inner cap had come completely off, so the cap would just fall off of the pen. Fortunately, I was able to order a replacement cap from the local Lamy dealer for only $15. 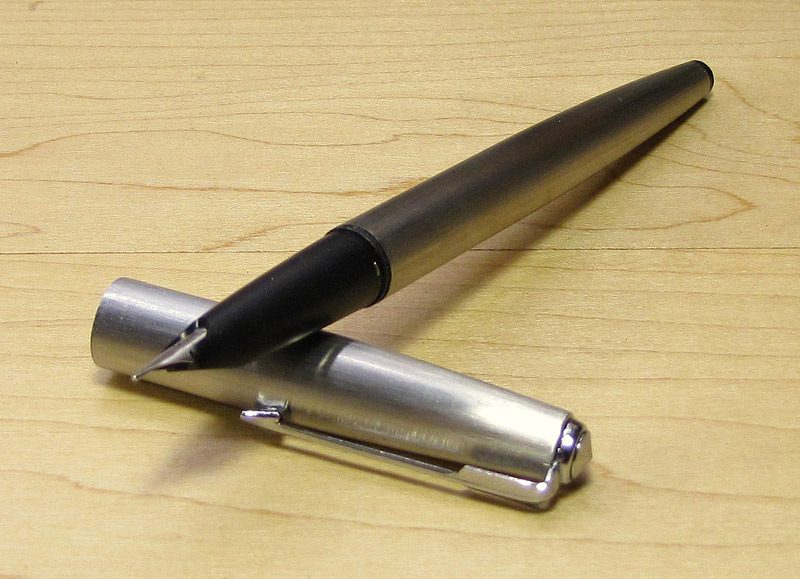 The Lamy ST, with the cap posted as shown here, is quite long. The inner cap of the Lamy 25P is somewhat less critical, since this pen has metal clutch fingers in the section, much like its adult sibling, the Lamy 2000. The sole function of the inner cap is to seal tightly around the section to prevent the pen from drying out. In fact, I hadn’t noticed that the inner cap was cracked until the pen became clogged with dried ink (Sheaffer Skrip Red) after about a month of non-use. I considered various ways of fixing the problem, most of which involved somehow forcing some sort of sealant into the cracks in the inner cap. The hard part would be to fill the cracks exactly, without any sealant protruding into the interior of the cap and without any valleys through which ink could evaporate. I was unable to figure out how to remove the inner cap to be able to work on it, so I gave up on that idea and set the pen aside for a while. Then, one day I came across the new all-stainless-steel Lamy 2000 while perusing Goulet Pens’ web site, and I had an idea. A terrible, awful idea. Also about a year ago, I purchased a pair of NOS Sheaffer pens from Peyton Street Pens. Along with my order came a free Hero 616, a Chinese clone of the Parker 21 (which in turn was Parker’s own entry-level look-alike of the Parker 51). Unfortunately, I never could get this pen working correctly, so it just sat around, not quite ready to be thrown out. The Hero 616 is a Chinese clone of a Parker 21. Somehow I decided to try the cap of the Hero on the Lamy, and lo and behold, it actually fit and remained firmly on the pen both when capped and when posted. After some playing around, measuring, and careful inspection, I confirmed that the very robust 616 inner cap also sealed tightly around the section of the 25P. In fact, it was this seal that brought the cap to a stop when capping the pen. There remained only two issues to resolve: the frosted Hero cap didn’t match the brushed stainless steel of the Lamy barrel, and the fake Parker clip and jewel didn’t really suit a Lamy pen. The texture of the cap was easy to fix. I once again disassembled the cap, and simply sanded it, in lengthwise strokes, with fine emery cloth (sandpaper for metal). It took a surprising amount of sanding to remove all the shine and achieve the look of the Lamy barrel. I used a block of dense foam behind the emery cloth as a sanding block. This shaped itself to the barrel, and helped keep the sanding strokes from veering sideways. I went over it a few times at the end with 5µm lapping film to make it feel less rough. The hand sanded Hero cap was almost a perfect match for the Lamy's brushed stainless steel barrel. I looked at various clips from my spare-parts pens and found nothing suitable. I finally decided that I didn’t mind the Parker clip, and just left it. The pen now looks vaguely like a Parker 45 Flighter. With its stainless steel Hero cap, the 25P now looks like a Parker 45 Flighter. Unlike modern cartridge-filled Lamys, the 25P uses standard international cartridges instead of Lamy proprietary ones. As a result, a standard international converter fits just fine. I purchased the one shown from Goulet Pens. The 25P uses a standard international cartridge or converter. Although this 25P with its medium nib wrote well, it did have a little bit more friction than I would have liked. About 30 seconds of light buffing with a piece of 0.5µm lapping film smoothed it up nicely. As an aviation buff and pilot, I’ve always been a fan of flighter style fountain pens (my favourite being the Parker 50 Falcon), and now I have a truly one-of-a-kind flighter. I have some questions about your Lamy, can you contact my via my mail address? I couldn’t find yours so I try on it this way. and that you had revised it. How GLAD I WAS that you listened………..